Historic and enchanting Borromean Islands are located right in the middle of Lake Maggiore in Northern Italy. This remarkable outdoor fixture may be found on the island of Isola Bella. This first picture was sent in by Wkirk in 2005. 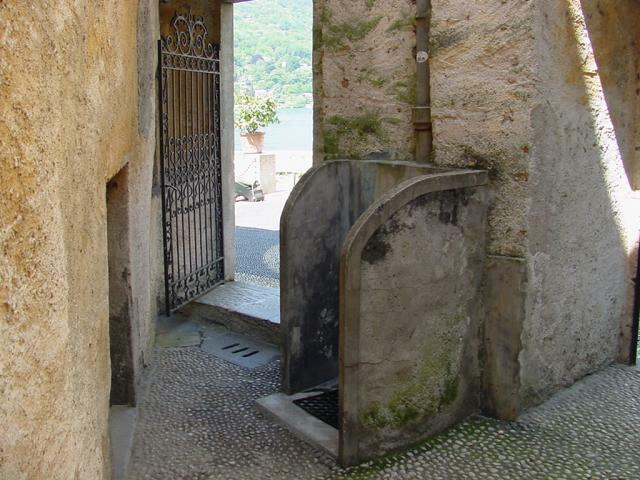 He writes: "While on vacation in Northern Italy I stumbled into this open air urinal. The date when it was built is unknown. This [fixture] is [located] on the north-east side of the tiny island, which is about 1/4 square mile [in size]. [The urinal] is still in use, but the area was filled with tourist so and I [did not] use it." The bottom two photos were sent in by Bob in 2006. He writes: "[This fixture] is located on a public thoroughfare between ancient buildings." More on the Borromean Islands: "With the snowcapped Alps as a backdrop, Lake Maggiore, the quietest in Italy, induces one of the oddest but most engaging moods to be found anywhere in Europe: an intriguing German-Latin mix of sensual brooding. The best way to absorb this landscape is to put yourself plunk in the middle of the lake, which is to say on one of the tiny Borromean Islands. These four marshy specks have stirred the imaginations of everyone from Napoleon to Stendhal, Dickens, Flaubert, Toscanini, and even Mussolini."